When your goal is good health, fitness and weight loss, then running on the treadmill is no disadvantage. When you burn a calorie on the treadmill is the same as a calorie your burn in any other activity. Your cardiovascular ability is improved at the same pace regardless if you are running on the treadmill, outside in the street or in the arena. You have planned to run for 5 kilometres. Do you dare to pass the threshold of your door and go out with bad weather? In such circumstances a treadmill is the ideal solution. You can exercise by running in the comfort and safety of your home. The treadmill sets aside the bad weather. The success of pace training depends on whether running repetitious, tension and relaxation, are in precisely predetermined speed and distance. When you do pace training on the treadmill, you can adjust the speed and thus ensure that throughout your workout you are running in the same speed. The treadmill does not allow you to slow down or accelerate; it keeps your speed at a steady level. This enforces you to keep the desired pace throughout the training. Once you start getting tired while running you slow down. But you do not realise that you slow down because you feel you have the same intensity and physical effort. In other words, you continue to believe that you are running on your desired pace. The treadmill will force you to keep the pace you had planned for your training. The only way to slow or reduce your pace is to deliberately reduce the speed of the treadmill. You cannot run continuously at maximum intensity. Your muscles need time for rest and recovery. Without resting intervals, you will not be able to complete your hard training program and therefore you will not improve. Running in low intensity is necessary to relax the muscles from the hard, intensive and long-term training. It may be very difficult to run at a relaxing pace and give your muscles the time needed to recover. This pace can prove too slow and that is why many runners have a tendency to run loose running at a very fast pace. The novice runners can also benefit from the treadmill for easy runs. It is very important for a beginner runner to gradually strengthen their unused muscles and tendons before making any sharp or quick training. Setting up the runway at “easy pace”, novice runners can avoid the natural tendency to run faster than they should. Hill training is one of the best and more efficient methods of training to build power and improve your running performance. The problem is that many runners live in areas with few hills, if at all. What you can do then where there are no hills around? Climb the treadmill. 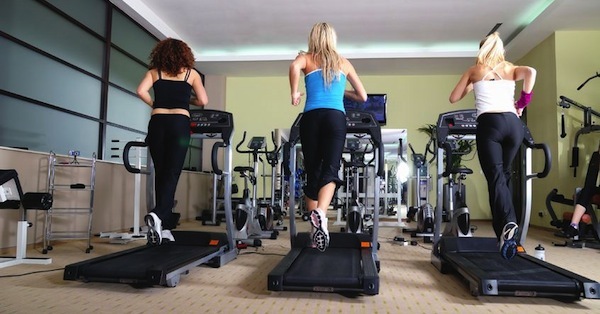 Most treadmills have slopes from 1-12%. Running on a daily basis into concrete pavements or road creates special charges to your joints. This may create you abusive injuries. Treadmills manufactured today are based on high standards to provide a stable running surface, but also friendly to the runner. The treadmill is ideal for beginners and runners but is also a good choice for a novice to start running. Most new runners start with walking. The treadmill is a great tool because it incorporates these first steps in a training program. The training with oscilloscope is a widespread method to control the intensity of running. Many treadmills have embedded heartbeat control. The training programmes of the treadmill provide unlimited potential and combinations of speed, distance and inclination. You can design a program that can provide exactly the kind of training you want. There are also some disadvantages with treadmill training like lack of air resistance, real running weather conditions, vision perception and running surface.Nevertheless it is good for indoor training. We have a new post on the disadvantages of treadmill training on the health section.